Well, lookie here. Mr. Tom Thumb decided to make an appearance. 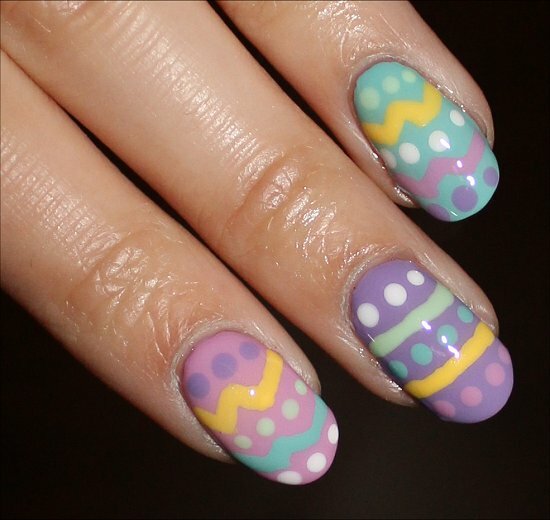 “What better occasion than for the unveiling of Easter Egg Nails?” He told me. 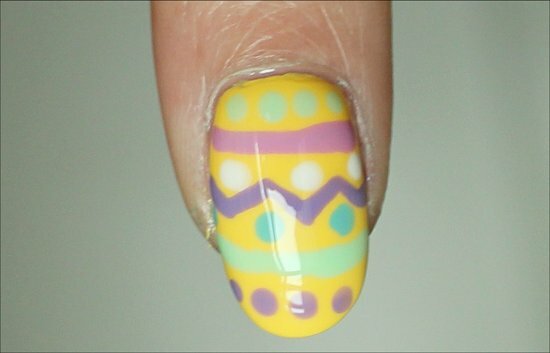 Today I’m going to show you how this Easter nail design is very easy to do. I’ll walk you through it step-by-step with written instructions as well as photos so you can see the process and not just the end result. This is really important to protect your natural nails from getting stained. And if you’re using a colour that unfortunately stained your nails in the past, consider applying two layers of base coat underneath to prevent it from doing it again. Okay, not everyone has a polish ‘problem’ (hehe, note the quotation marks) like I do. If you don’t have many colours to work with, it’s okay. 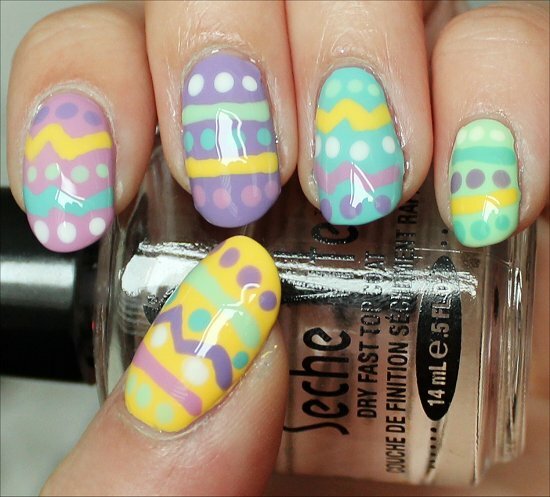 You can use just two colours and alternate the hue for each nail. But, if you have a generous palette to work with, I suggest using 5 different colours that you think will look nice together. The more colours you use, the more you can play around with making each egg look different. Put a few drops of polish onto your piece of foil, which you’ll be using as a palette. Then, dip your striper brush into it. 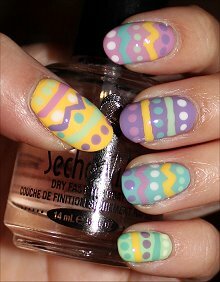 Take your time to carefully add zig-zag and horizontal lines for each egg. For my nails, I did zig-zag lines on my thumb, index, and ring fingers, and horizontal lines on my thumb, middle, and pinkie fingers. I also used 2 lines per nail, except for my thumb, which has 3 lines since I had more space to work with. Feel free to go where your imagination takes you! 🙂 While I’m flattered if you choose to recreate this look, don’t be afraid to experiment outside the box and add both zig-zag and horizontal lines on each nail…or even adding more than 2 lines per nail. 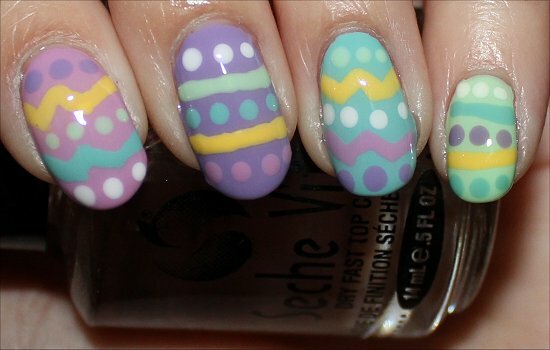 I used a single nail-art striper brush to create all the lines. I suggest painting on the lines with the lightest-coloured polish first (e.g. yellow), and then work your way to the darker shades (e.g. purple). In between colour changes, just wipe your brush onto a piece of paper towel. This will help minimize any colour bleeding. To achieve opacity, you may need to retrace over your lines more than once. Also, to get more-even lines, I found that it’s the easiest to work from the left edge to the middle, and then dip your brush to get more polish before drawing the other side of the line from the right edge to the middle. After that, you add more polish on top to even things out. This technique is way better than trying to draw the complete line (left to right) all in one shot. Not everyone has a steady hand. I sure don’t – my hands are movers and shakers. 😉 I’ve found that it helps to firmly plant your painted hand on a table and then rest part of your working hand on the table, too. This will reduce any extra shaking. 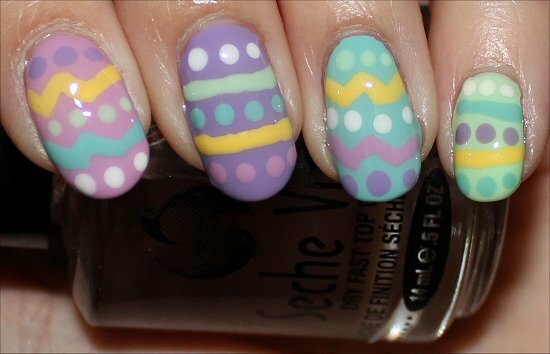 I liked to add my lines first so that I had a better idea of the spacing for each nail. However, if you wanted to add dots and lines in the same step, that’s up to you. This is the crucial part: Make sure that you wait about 20 minutes or more to allow all this to dry a bit. The dots and lines will be thick pools of polish, and if you jump the gun and slick on a top coat too soon, you’ll smear your design badly no matter what top coat you use. I waited 30 minutes to be on the safe side. And then when I put my quick-dry top coat on, I made sure to add it very delicately. 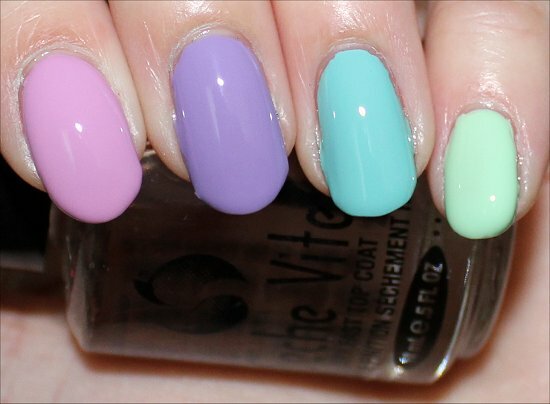 You basically want the bead of top coat to touch your nail without pushing the polish brush onto your nail. If you use a light hand, you further minimize the risk of smearing your design. This entry was posted in Nail Art, Nail Polish Swatches & Reviews, Product Reviews, Tutorials & Tips and tagged ASP / All Season Professional, China Glaze, Daniel Stone, L.A. 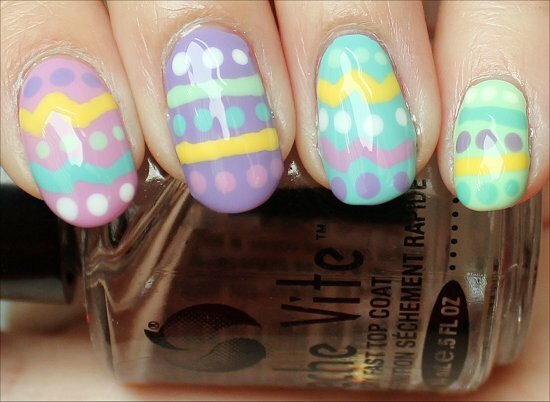 Colors, OPI, Orly on April 4, 2012 by Mary S.. This is so cute Mary!! Lol @ your thumb. Very cocky, isn’t he? So happy to hear that you found my tutorial useful! 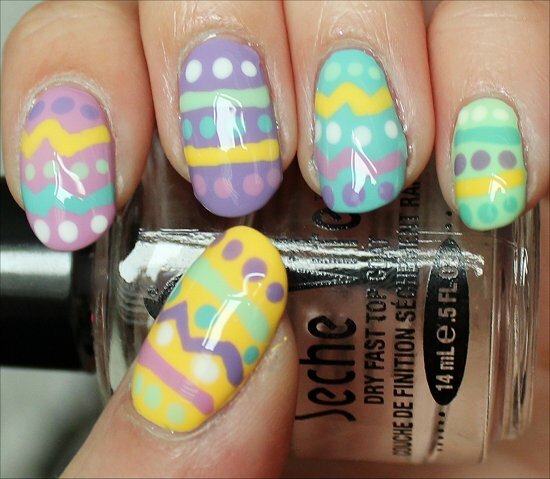 Hope you do a fun manicure for Easter! This looks so cute! I love the colours you used. I didn’t know you could get Cadbury Creme Eggs in Canada. I thought they were just something we have here in the UK. XD They’re my favourite Easter chocolate too! Oh, if we didn’t have the Cadbury Creme Eggs here, I’d be so sad. I seriously wait all year to get them and overindulge during Easter. The filling is the best! Kelly recently posted: Blogger Appreciation Award! Yay – I really hope you do try it out. It’s really fun to sport a bunch of colours all at once! This is sooo cute, Mary! 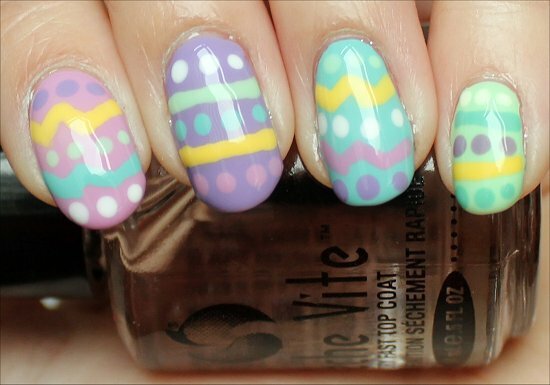 I’m definitely trying this later this week for an Easter look! Really cute and even one I (Ms non artsy) could do! Love the shades. Definitely try your hand at it. 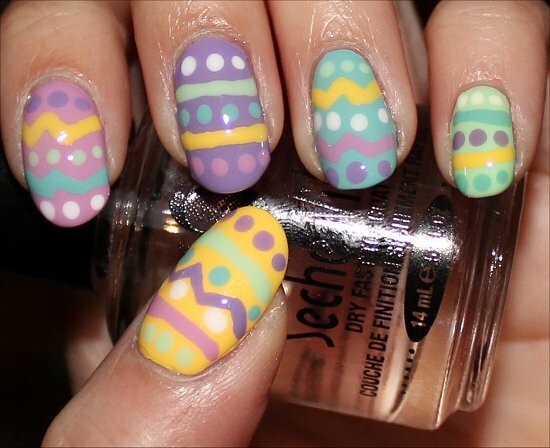 Not only is it festive, but you’ll have so much fun decorating your ‘eggs’! It was a very relaxing exercise for me. This tutorial is adorable!! I really want to try this but maybe with one base color. Sure, one base colour would still look great. 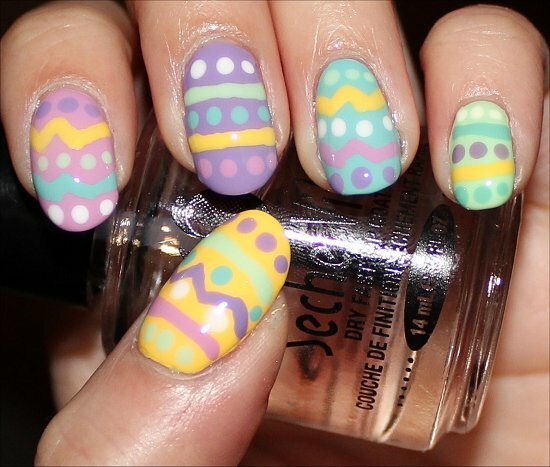 And you can decorate your ‘eggs’ however you see fit. There’s oodles of room for self-expression! 😀 DO IT! DO IT! Same here – lots of happy childhood memories during Easter. My family was always tight on money, but we always had a great family dinner to celebrate Easter. OMG This is so cute!!! I’m gonna try it too!!! I tried a sweet tooth inspired nail too, but mine was a fail. 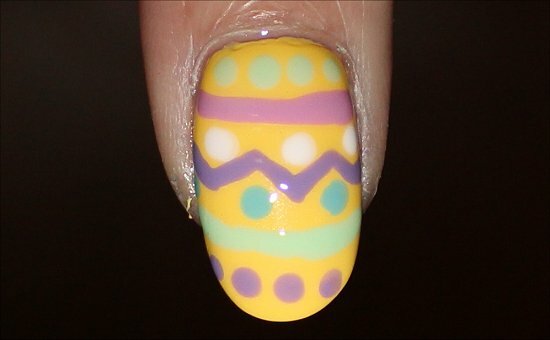 It was peep bunny inspired…major fail since its not easy painting peep bunnies without a brush. I think its time to buy some haha. Mmm…peep bunnies are so yummy. It’s too bad that your design didn’t turn out the way you wanted it to. Even just the idea counts for a lot. You’re so creative! So freaking cute! I have off tomorrow and might try this for my Easter manicure 🙂 I don’t have a striper brush but I’ve got the dotting tools and I might be able to figure how to use one of them to get the line effect. 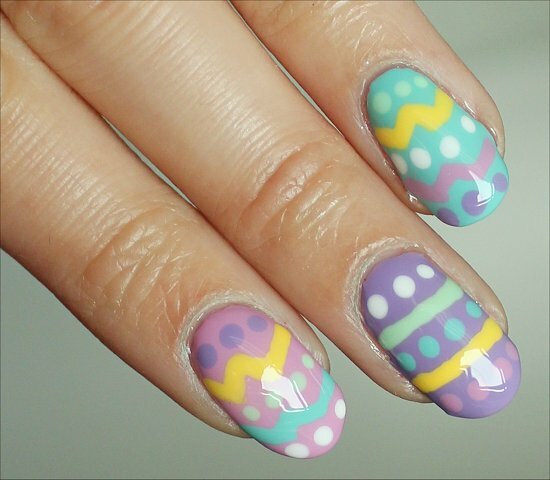 I’m honoured that you’re even considering trying out this Easter manicure. 🙂 You can make it work with a dotting tool if you use a stippling motion. 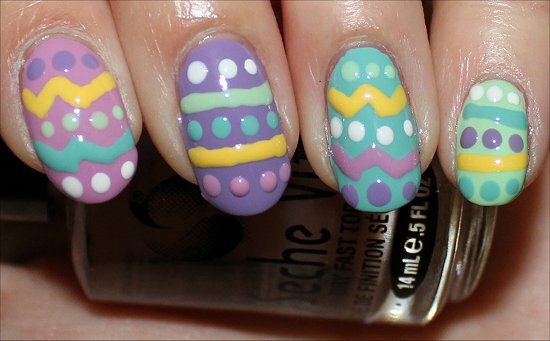 Your nails look so dressed up for Easter! Well, a positive for having square eggs is that they’d stack better. 😉 Hahaha! Hope you had a yummy family feast. And that Easter egg hunt sounds like so much fun. You know, I think I’ve only been on an Easter egg hunt 3 times in my life. I wouldn’t mind going on one next year. THREE bags of those mini eggs? WOWWWWWWWWW – So…when are you gonna invite me over…y’know to…umm…help you…eat those eggs? 😛 I know. It’s a tough job, but somebody’s gotta do it. 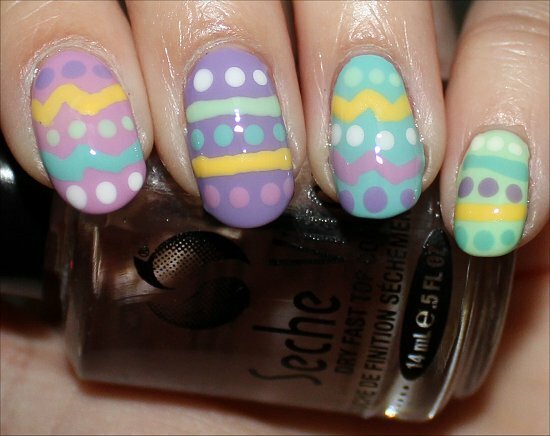 Just got my post up for the Easter eggs that I did using this tutorial. Your nail art may be superior, but I think I might have you beat on the cute factor. Check out the post to see Daisy the dog! Another Cristina recently posted: Easter egg (dog) hunt! 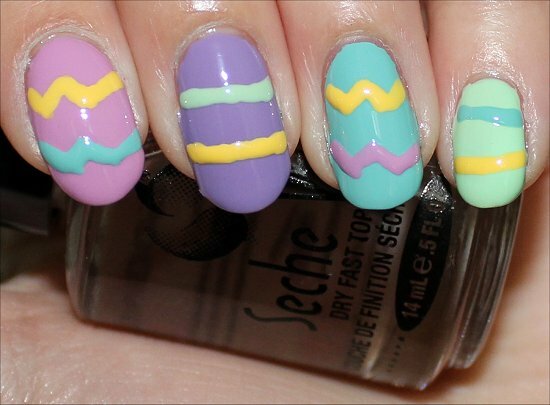 Thank you so much for the easy Easter Nail Inspiration!! I have never tried anything like thhis before, and I was so excited to share my results with you, yet I do not see where I can upload a pic, so I posted on my FB and Instagram. I love my results & I am glad I tried!